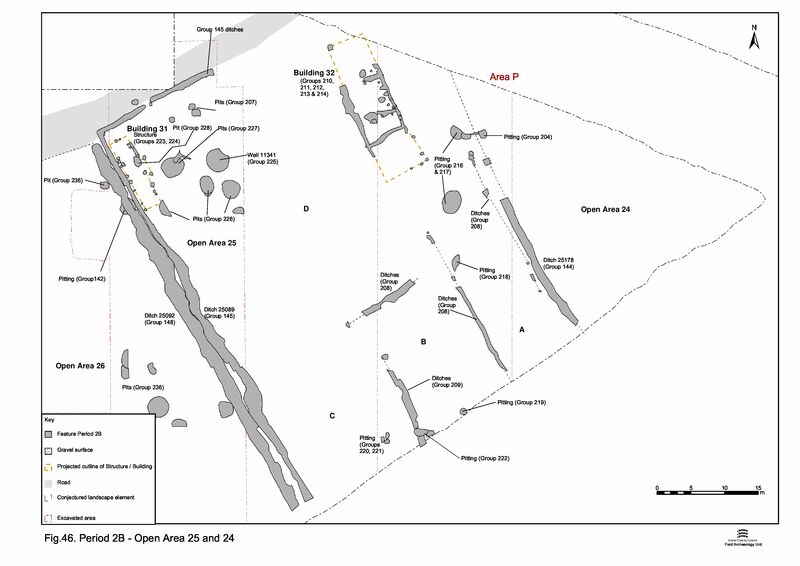 Despite investigation largely being limited to the east side and north-west corner of OA25 (Figure 46), there is considerable evidence for Period 2B occupation activity within the enclosure. Most importantly, two buildings are present within the northern part of the enclosure. These demonstrate both a change from circular to rectilinear buildings and the moving of such structures from central to roadside positions, as is perceived to be the case in other southern zone enclosures. Alongside the buildings, metalworking activity is located within the front part of the enclosure. That part of the enclosure to the rear of these buildings is subdivided into sub-plots, presumed to denote gardens and animal pens. Four subsidiary areas are defined, which are identified as OA25 sub-enclosures A-D). Activity in all these areas is limited to pitting, with the sole exception of the construction of Well 11341 between Buildings 31 and 32. Located in the north-east corner of OA25, Building 32 is a rectilinear structure which survives as an arrangement of shallow foundation slots 25173 (segs 8677, 8678, 19095, 19151, 19153, 19164 Group 210) and post-holes (8553, 8568, 8572, 8579, 8583, 8592, 8600, 8603, 8629, 8932, 8958, 8964, 19017, 19051, 19061, 19090, 19119, 19121 Group 211), some of which were within the slots (Figure 20). The building clearly shares the alignment of the boundary ditches and is sited at the front of the plot, adjacent to Road/track 3. The central part of the building is the best preserved, defining a room measuring c. 8.0m by 5.5m internally. An internal partition subdivided the room into two areas (in a precise 2:1 ratio). At either end of this room are the partial remains of at least two further rooms. The southern room is largely defined by post-holes (8932, 8958, 8964, 19017, 19090) rather than slots and is conjectured to be approximately 6m long; it may, given the different construction technique, be an addition (this southern extension of the building is the only, inconclusive, stratigraphic evidence for Building 32 pre-dating Building 14). To the north of the central room, the building's foundations survive only as intangible features. Consequently, the north end of the building is not identified but, if the northern room is assumed to match the dimensions of the central room, the external dimensions of Building 32 may be as much as 22m long by 7m wide. Within the building are fragments of clay flooring (8994 Group 212) and internal hearths 8746 and 8509 (Group 213). While these are fragmentary, there is little doubt they belong to this structure. Further fragments of brickearth floor 8722 (Group 214) seem to be a replacement or repair. Whether it is of Period 2B date or is associated with its surmised continued use in Period 3 is uncertain. Finds from the collective structural features are sparse, with only a small assemblage of pottery (from 8677/25173 and 8932), vessel glass and daub being recovered. The pottery mainly consists of Late Iron Age fabrics, and a single sherd of samian is judged intrusive. Judging by the 'clean' nature of the fills of the foundation slots, these would seem to date the construction. Pottery from occupation deposits 8509, 8746, 8994 (Groups 212, 213) within the building yielded small amounts of pottery including imported fineware and sherds in Roman fabric, which provide an early to mid-1st century AD date. Period 3 features respect the Building 32 footprint and there is a strong presumption that the building continues to occupy this plot into the early Roman period (see Southern zone, Open Area 25 (east side)). Within Building 32, a second orangey-yellow clay layer (8722 Group 214) overlies one of the hearths (8746). Presumably representing replacement of the floor, at least in the area of the redundant hearth, it contains little diagnostic pottery (GROG, BSW) and its date is consequently poorly defined. Although located on wall-lines of the building, cuts 8690 and 8702 (Group 215) seem too large to be post-holes per se. They may represent robbing actions after the disuse of the building or post-date it completely, but could at least hint at the former positions of some of its structural uprights. 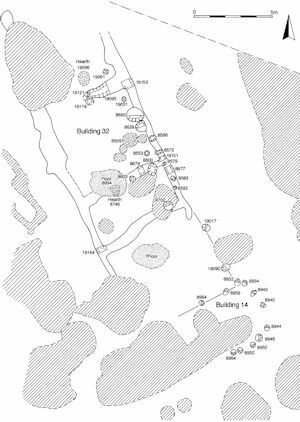 Building 31 is positioned in the north-western corner of OA25, tight against the western enclosure boundary, ditch 25089. Its foundation remains comprise slot 10822 (Group 223) and a quantity of post-holes of varying sizes (Group 224), two of which (10837, 10876) are within the slot. 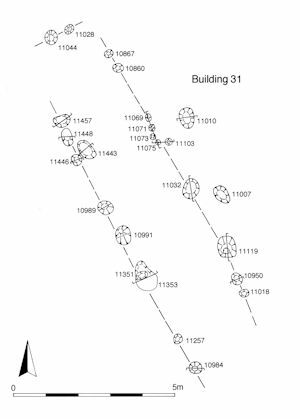 Collectively, these define a narrow strip building only c. 2.5m wide (Figure 47). No certain southern end to the building is identified, but it may be c. 11.5m long. No partitions, floor surfaces or internal hearths are present within the building. Given the position of the building within the enclosure, access into it is probably by a door located on its east side. The position of this door (and maybe a shallow porch over it) may be marked by post-holes 11007 and 11010 (Group 224) lying outside the main wall alignment. Given its very restricted width, Building 31 would seem to be an ancillary structure. Like Building 32, it is clearly orthogonal to the boundaries of Open Area 25. The building is presumed to post-date Period 2A pit 11337 and construction during the mid-1st century AD seems likely. Its constituent features contain scant dating evidence; predominantly grog-tempered pottery with occasional Roman wares. The building clearly passes out of use by the end of the 1st century AD, by which time further pits are dug on its site. A distinct cluster of five possible hearths is positioned alongside the Road/track 3 frontage toward the north-west of OA25. Shallow cuts or scoops 10894, 10895, 10929, 11045 and 11050 display some evidence for in situ burning and contain burnt debris in their fills. Of the five, 11050 is the largest and most irregular in shape; it may rather be an associated pit that contains burnt material, rather than a hearth base per se. Perhaps significantly, it is also the only one to include artefacts - an iron sheet fragment, nail, hammerscale (40g), slag (505g) and a small quantity of pottery. 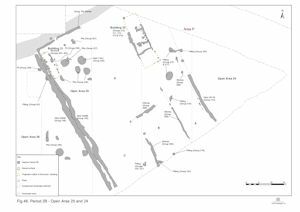 Four distinctive pits 10873, 11197, 11228 and 11248 (Group 207) are located in the north-west corner of OA25, in close proximity to the Group 205 hearths (above). The pits are small, roughly square and of broadly similar size. They contain seemingly related fills that include small quantities of slag, hammerscale, and copper alloy. Copper-alloy cast waste is present within 11197 (SF5807). Pit 11248 features a range of iron items, including a carpenters dog (SF5255 and various block, bar, plate and sheet fragments. Pits 11197 and 11228 also contain crucible fragments and a relatively large amount of pottery, the latter probably derived from their subsequent backfilling with domestic waste. Pit 10873 lies further north, actually outside the southern enclosure system, in what is or becomes Road/track 3. Containing Dr. 1 amphora sherds, it may be the earliest of the pits to be filled, perhaps even as early as the late 1st century BC, although this material may be residual. Poorly recorded pit 10871 (Group 206) could perhaps be regarded as an addition to this pit cluster, though its shape and contents are less distinctive. It must be noted that these 'industrial' pits are somewhat reminiscent of the Period 2A hearths (Group 205) that occupy this vicinity a little earlier. It is likely that a thread of continuity in manufacturing and/or processing activities occurs in these southern zone enclosures either side of the settlement remodelling episode. 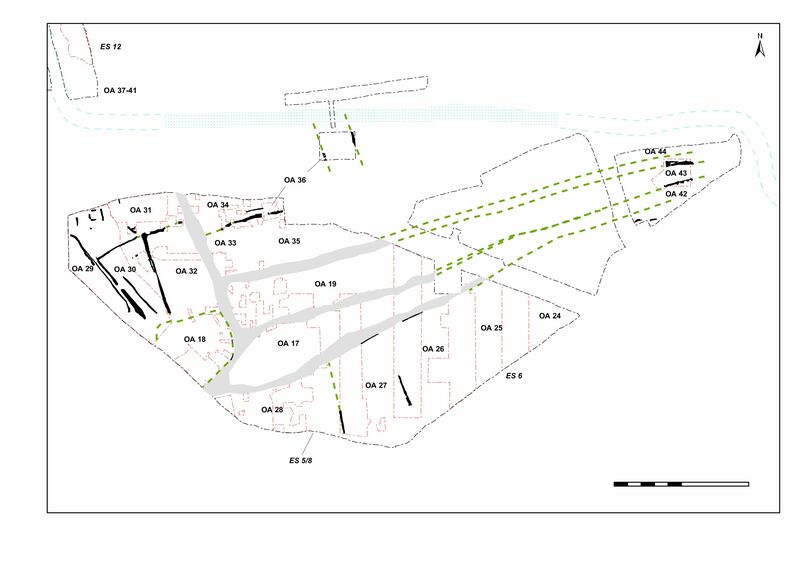 This is similar to the relationship displayed between Period 2A and 2B industrial pits (Groups 43 and 94 respectively), the latter located toward the front of Open Area 26. The southern part of the excavated portion of the OA25 interior is subdivided by probable fencelines, represented by a number of linear gullies or slots. These run orthogonal to the boundaries of the enclosure, and to the buildings within it, and clearly relate to its subdivision and use. Features 25093, 25096 and 25176 (all Group 208) are only broadly dated to Period 2 in general. Narrow slot 25093 (segs 8828, 19033) runs parallel with, and 1m west of, the eastern boundary of OA25 (25178) for a traceable distance of 23m. Its north end appears to terminate in post-hole 19032, significantly, at a point in line with the probable southern end of Building 32. Its southern end is not defined. It is likely that 25093 represents either a fence or other boundary, such as a hedge, reinforcing the eastern boundary. Approximately 10m further west, parallel slot 25096 (segs 8657, 8696, 8698) is of similar proportion to 25093 and filled with comparable material. From its northern terminal, this gully runs for at least 25m before leaving the southern limit of excavation. Broader gully 25176 (seg. 8680), is west of 25096 and runs perpendicular to it. Traced for a distance of c.12m, it presumably marks the northern boundary of sub-enclosures laid out across the rear of the enclosure. Similarly proportioned gullies 25095 (segs 8610, 8659) and 25267 (segs 8613, 19178) (both Group 209) represented two phases of another sub-dividing boundary running parallel to 25096, approximately 14m to its west. These are more closely dated as Period 2B and presumably pass out of use by the mid- to late 1st century AD, when they are cut by Period 3 Roman pits (Group 222). Well 11341 is positioned toward the front of OA25, between Buildings 31 and 32. Circular construction cut 11341 is 2.4m diameter and contains vertical shaft 11711 at its centre. No well-shaft lining is evident, although the feature was only excavated to a depth of 1m owing to the high water table. The construction cut is backfilled with clayey sands and gravels. A construction date in the earlier to mid-1st century AD is likely on the basis of the dating of the earliest fills encountered and of its stratigraphic position - the well post-dating Period 2A pit 11437 (Group 61) of late 1st century BC-early 1st century AD date. It is less clear how long the well remains in use. Deposits still accumulate into the mid-3rd century AD within the slumped depression over the backfilled well. However, some mixing of finds from true backfill deposits and these later accumulations seems to have occurred during excavation, and what was recorded in the field as separate 'pit' 11303 is more likely an erosion cone and final accumulation in the top of this well. 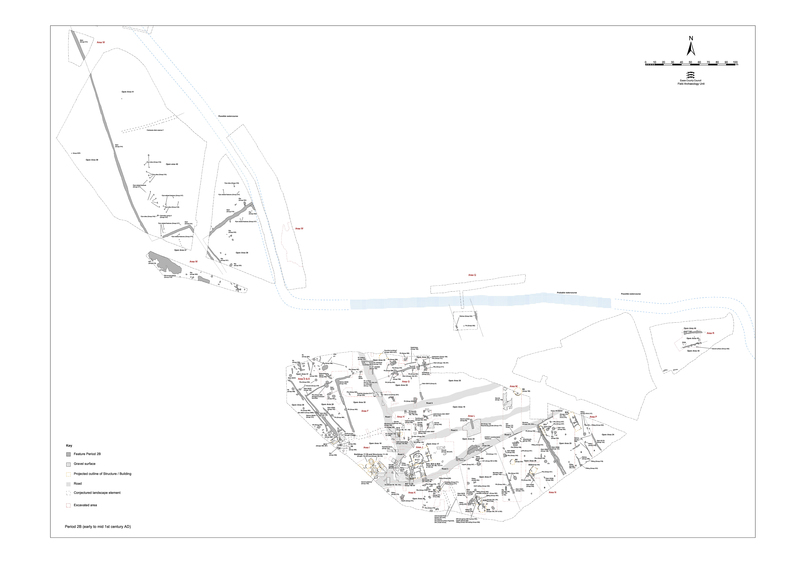 The well may function until new Well 8989 (Group 662, Period 3) is constructed within OA25 in the mid-2nd century AD. 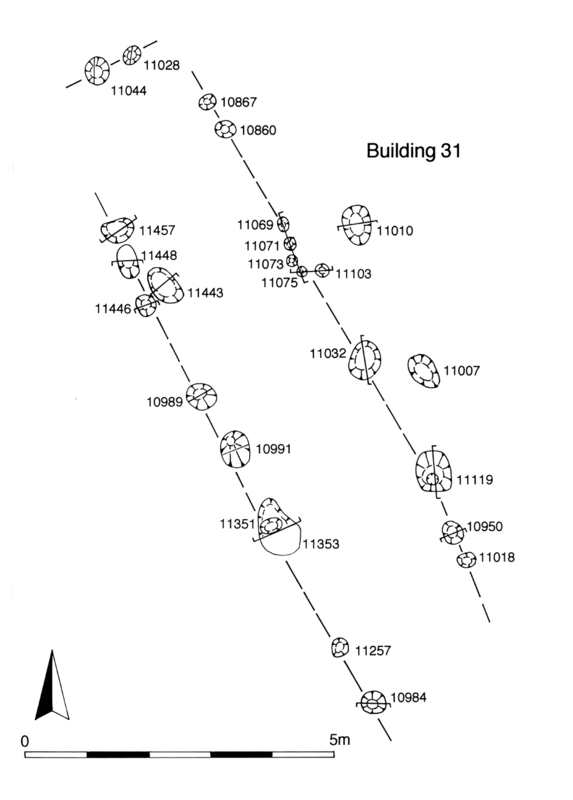 The pits in the vicinity of Building 31 and Well 11341 are large and generally circular (10816, 11192, 11221, 11324, 11358, 11724, 11730 Group 226). They overlie a cluster of Period 2A pits and contain the same kinds of finds assemblages; some may constitute continuity of the patterns of Period 2A activity and rubbish disposal into the mid-1st century AD (though there is obviously a risk that some material is being redeposited as the later pits cut through the earlier). Pit 11730 is a re-cut of 11724. Pit 10816, sits over the enclosure ditches at the extreme north-west corner of Open Area 25. Rather than being a waste pit, this cut may instead be related to the possible widening of the entrance to Open Area 25, which has been mentioned above. Pit 11316 (Group 227) post-dates Period 2A kiln 11477 (Group 57) and contains KPG8 which is dated to AD 5-20. Many of these OA25 Period 2B pits, such as 11221, 11724 and 11730 (Group 226), acquire rubbish during the early 1st century AD, but continue to accumulate material well into the middle of the century. In addition, pits 11221 and 11730 contain small quantities of ceramic building materials, almost invariably from upper fills, suggesting a transitional mid-1st century, rather than purely pre-conquest, date may be appropriate. The upper fills of 11316 (Group 227) contain significant quantities of tile and are 2nd century in date, though whether this indicates continued use of the feature or later infilling of a subsidence hollow is not clear. Otherwise, finds are typically limited to pottery, daub, briquetage and loomweight fragments. A few pits contain small quantities of slag. Pit 11221 includes a copper-alloy hairpin (SF5803) and an early 1st-century AD coin of Cunobelin (SF5819), while pit 11324 is notable for its relatively large quantity of slag (2kg). Pits seem conspicuously absent from the southern end of the enclosure, the only other significant concentration comprising 8879, 19089 and 19142 (Group 216) to the south and east of Building 32. These are probably associated with its use. They date to the first half of the 1st century AD. Pit 8873 (Group 217), also close to Building 32 and dating to the first half of the 1st century AD, is distinguished as it clips the eastern enclosure boundary ditch 25178. Oddly, it possibly forms a 'pair' with pit 8907 (Group 204) on the opposite side, in OA24. A few further pits occur within the sub-enclosures to the south of Buildings 31 and 32. Pit 8841 (Group 218) of mid-1st century date lies in OA25A. Pit 8725 (Group 219), dating to the first half of the 1st century AD, lies within OA25B. Within OA25C, pit 8556 (Group 220), dates to the first half of the 1st century AD (the Roman material in it was certainly introduced during excavation, when it was not initially clearly distinguished from latest Roman pit 19172). Two further pits 8528 and 8542 (Group 221), broadly dated to the Late Iron Age and phased in Period 2 General, may also function in OA25C. Other than pottery, there are only very small quantities of baked clay, briquetage and animal bone (of which briquetage seems the most recurrent) within these OA25 pits. Pit 8594 (Group 222) post-dates the OA25B/C subdivision line. It dates to the earlier 1st century AD. Pit 10893 (Group 228), dated only by a grog-tempered jar, must post-date the construction of Building 31. However, it is unclear whether this feature relates to the continued use or disuse of the building.